Despite the Owls impressive win over Bowling Green, the Lions best not be looking past their match up this weekend against wisconsin. Kick off against Al Golden and Penn State East, er, Temple, November 11th, at 3:30pm - game to be televised regionally on ESPN. How is it that we keep winning these weekly honors (5 so far) - but our team still looks disjointed. We obviously have the talent and the performances - the coaches just need to bring it all together. Temple football defeated Bowling Green 28 - 14 on Saturday, breaking a 20 game losing streak. It's quite a remarkable feat; getting that first win is probably the most difficult. The team celebrated like they had won the super bowl, pouring a cooler of gatorade on their coach - it was a great day for a program that has been struggling for so very long. Coach Golden dashed off to the hospital after the game to be with his pregnant wife who had been hospitalized for "mild complications." The Owls travel to University Park on November 11th. Sadly, their possible win streak (unfortunately, not likely as they face Central Michigan this week) will definitely end then. Fight fight fight for the cherry and the white! Penn State makes the trip to West Lafayette, IN this weekend to face the purdue boilermakers. purdue has weathered a tough couple years - last year being the pre-season media darling (iowa is this year's purdue) only to falter, and this year they boast an offense which can run all over the field, but a defense that can't keep the opposing teams from doing the same (think 1990s BYU). Penn State should be able to score points on this team - and hopefully the defense can toughen up. this game should be an easy win for the Lions, but purdue is pesky, and PSU hasn't shown much cohesiveness lately (on or off the field). As always, I am completely optimistic that Penn State will carry the day and become bowl eligible on Saturday. He and Connor have been named semifinalists for the Bednarik Award, and Paul is also a semifinalist for the Butkus Award. The Lott award is worth noting as it is awarded for performance and character on and off the field. Posluszny has established himself as an elite football player, but his performance in the classroom, as a Finance Major, is outstanding as well. I believe that Jay is either 38 or 39. That Michigan game... well, it really didn't hit me as hard as the nd and tosu games - perhaps you don't feel the third kick in the teeth as acutely as the first two. 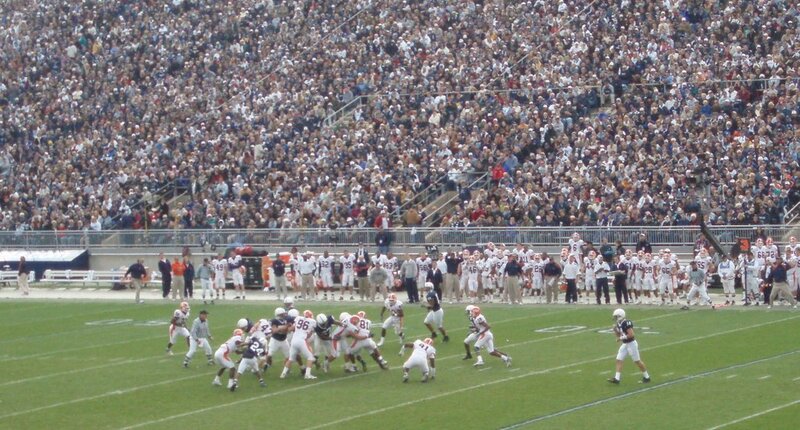 Ironically, this is the one of the three where PSU actually had a legitimate chance to tie/win. The game was close - a few loose plays by the PSU defense gave UM a 2 touchdown lead, and then Tony Hunt broke free on a routine screen - and brought the Lions back within a touchdown. 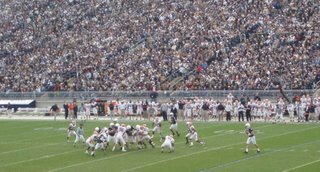 The PSU defense stood tall - well, Lloyd Carr got super conservative and stupid and gave the ball back to the Lions with about a minute left on the clock - sounds like the beginning of a great comeback story, but it isn't. The offense did nothing with their gifted opportunity and turned the ball over on downs. Jeremy Kapinos continues to be the star of the team - his punting is the one factor that has kept PSU in the tight games. And please, for the love of puppies and kittens, Throw the ball to Butler! PSU's inability to score points is more and more alarming - it's not like last year where if the Lions missed a scoring opportunity we thought, ehh, they'll get points next time - because this year there isn't a "next time" - the sustained quality drive is not an attribute of this year's team - to not capitalize when they do get within range is crippling/fatal. The Defense, while impressively holding um to 17 points (and none in the 1st quarter), did not "create" much - they never "got to" Chad Henne - when your offense is floundering, the defense has to step up and make things happen, if not score the points themselves. Now, it's not always great when your punter is your star - but Kapinos is something special. He creates and reclaims field position advantages. As the article states, Kappy is just about 100 punting yards behind the Penn State career yardage leader - Ralph Giacomarro - the punter for our 1st national championship team. So Penn State is making the trip out to minneapolis this weekend after all of the hullabaloo about the baseball playoffs. Black Shoe Diaries has a nice write up about the game. The sentiment on the internet is, basically, that Minnesota has a young, inexperienced team and a very suspect defense. But, as always, the Lions need to be prepared to play and play the entire game. Penn State beat up on the gophers last year (and Michael Robinson's now legendary hit on the um d-back ended the kid's football career) so minne is definitely not looking past the Lions. There are still key injuries on the PSU offensive line - hopefully the offense can pick up where they left off in the second half of the northwestern game - and, throw the ball to Butler! The D needs to be tough - and create turnovers. Special teams, as always are important - Kelly needs to get all the confidence he can. Game time is 12pm(EST) - which isn't always a great start time for PSU and the first "early" game of the season - ESPN is broadcasting the game regionally - so check your local listings. In Philly they're airing the game on My Phl (Channel 17). 2 the Lion! Let's go State! The game may air on ESPN2 - or maybe ESPN regional - when will we know? perhaps not until after the MLB games on Friday. Yes, Friday night. GoPSUsports.com - PSU win, 33-7 - Deon Butler sets Penn State single-game receiving yardage mark with 11 catches for 216 yards: "Deon Butler sets Penn State single-game receiving yardage mark with 11 catches for 216 yards"
GoPSUsports.com: "First Phase of Beaver Stadium Enhancements Complete"